Freddie Mercury, lead singer for the Rock Band Queen, was once quoted as saying that he didn't want to be a rock star, he wanted to be a legend. While alive, Freddie Mercury was known as an entertaining and energetic rock star. Since his death at the fairly young age of 45, he has become a legend. Freddie Mercury is considered by many to be one of the greatest vocalists in contemporary music. His remarkable voice covered a span of nearly four octave range allowing him to sing in both the baritone and tenor ranges. As the lead singer for Queen and also as a solo artist, Freddie Mercury created and performed technically complex songs blending several different styles of music from heavy metal and rock to disco, opera and ballads. His wide range of styles appealed to millions of fans around the world. Even though it has been nearly 23 years since his death, the Music of Queen and the legacy of Freddie Mercury live on through the incredible music. The group was inducted into the Rock and Roll Hall of Fame in 2001. 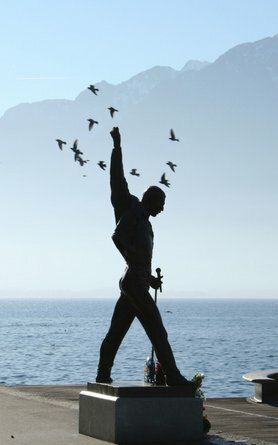 Image of Freddie Mercury Statue Montreux from Wikipedia. Wikimedia. His death broke the silence surrounding AIDS. For me the music of Queen and Freddie Mercury are the songs that I grew up with in high school and college. "We Will Rock You," "We Are the Champions," "Bohemian Rhapsody," "Somebody to Love," "Radio Ga Ga," "You're My Best Friend," "A Kind of Magic," "Who Wants to Live Forever," and "Princes of the Universe" are just some of the many songs I remember from this time. Hearing these songs takes me back to those times. A Google doodle tribute to artist, performer, and pioneer Freddie Mercury for his 65th birthday in celebration of Freddie for a Day from the Official Queen YouTube Channel. 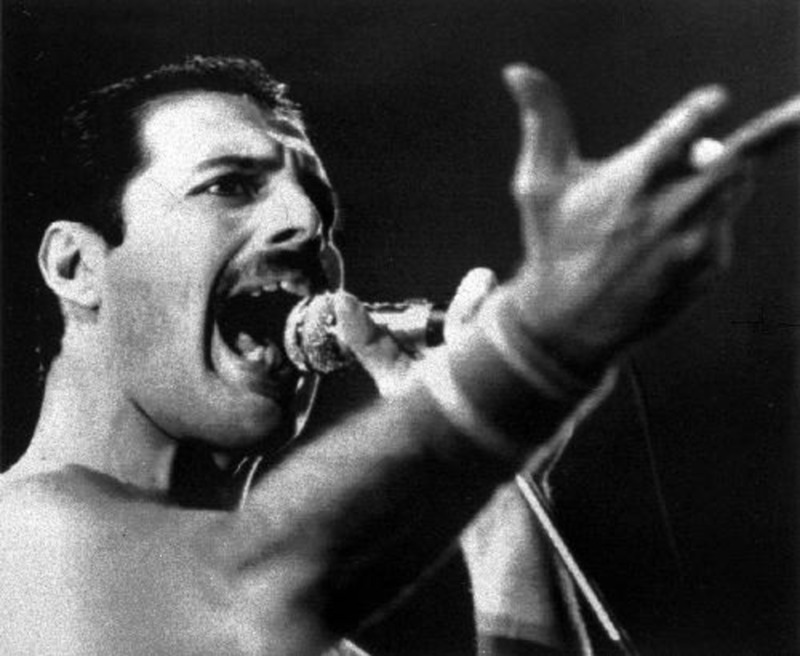 Freddie Mercury has been voted the ideal frontman in a dream rock band. In a survey carried out by Electronic Arts, the late singer of legendary rock band Queen beat Mick Jagger and Kurt Cobain to the title. The poll was to celebrate the release of new XBox 360 game Rockband, which allows players to simulate playing music to some great rock tunes. Music news from Virgin Media. Queen News June 2008 from Brian May's Official Website. Freddie voted fantasy band frontman, the official ITV home of Music News at ITV Music; includes Articles. Visit itv.com for Entertainment. The infamous Freddie pose from their 1986 concert at Wembley Stadium. Framed Music Poster Print - 24" X 36"
Bohemian Rhapsody has been voted the best pop song of all time in a poll of more than 10,000 music fans in the U.K. conducted by www.onepoll.com. The results were announce in July 2008. The song was a hit when it topped the charts in 1975 and found a resurgence in popularity again after lead singer Freddie Mercury died in 1991. Bohemian Rhapsody voted best pop song reported on Music Story Page. Queen anthem Bohemian Rhapsody has been voted the best pop song of all time. BOHEMIAN Rhapsody by Queen was yesterday voted best pop song of all time. Freddie Mercury only died one day after releasing a statement that he had AIDS and encouraged fans to pick up the fight. "I hope that everyone will join with my doctors and all those worldwide in the fight against this terrible disease." 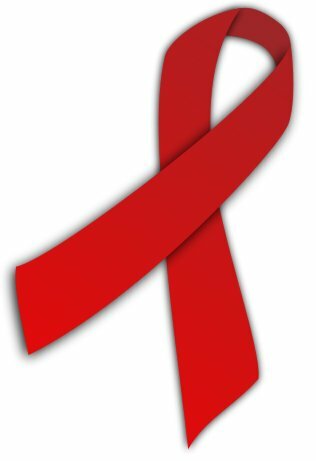 I was affected by the death of Freddie Mercury in 1991 because it came within a few months after I'd lost several patients to AIDS as a young medical student, so his death has always been linked to the deaths of my AIDS patients. His death occurred during the time when the medical community was still learning how to treat this devastating disease: it was a time when so many people, especially young men, were dying quickly from opportunistic infections and were dying much too young. The only thing medicine could offer many of them was hospice or end of life care to support them and keep them comfortable during their last days. This lens remembers the life of Freddie Mercury and commemorates all of those who died too young during the medical community learned how to treat the AIDS virus and those who have died since in the 25 years that AIDS as been identified as a disease. Red Ribbon. Permission is granted to copy, distribute and/or modify this document under the terms of the GNU Free Documentation License. I like people to go away from a Queen show feeling fully entertained. Includes information on purchasing special Freddie Mercury merchandise as well as information about Queen + tours and the Musical "We Will Rock You." This next song is only dedicated to the beautiful people here tonight. That means all of you. Thank you for coming along and making this a great occasion. After re-watching all of the video clips from the LiveAid concert it isn't hard to see why Queen with Freddie Mercury was voted the Best Group at LiveAid. Their 1985 Live Aid performance was voted the best live music performance of all time in a BBC poll. The reason we're successful, darling? My overall charisma, of course. Freddie Mercury performs Barcelona with Montserrat Cabelle. I think in the end, being natural, and being, being actually genuine is what wins. What do you think of Freddie Mercury? Freddie Mercury was the greatest! Freddie Mercury is my hero! I didn't know much about Freddie Mercury but now I do. I try not to think about him. Another of the last videos done by Queen with Freddie Mercury. The song is thought to be about AIDS related dementia and how he feels about his fight against the disease. It is sad and humorous at the same time. become a strip artist or something. This is the last video done by Queen with Freddie Mercury. You can really see how thin and gaunt he has become from the disease. Freddie Mercury - "AIDS changed my life"
AIDS changed my life. I have stopped going out, I've become almost a nun. I was extremely promiscuous, but I've stopped all that. What's more, I don't miss that kind of life. Anyone who has been promiscuous should have an AIDS test. I'm fine, I'm clear." It wouldn't be too long before we would discover that this statement (about being clear) wasn't entirely true. Wikipedia. Wikimedia. Red Ribbon. Permission is granted to copy, distribute and/or modify this document under the terms of the GNU Free Documentation License. However, the time has come now for my friends and fans around the world to know the truth and I hope that everyone will join with my doctors and all those worldwide in the fight against this terrible disease. My privacy has always been very special to me and I am famous for my lack of interviews. Please understand this policy will continue. Last public statement, made one day before his death. Read more about Freddie Mercury. As Freddie Mercury, he showed the world just how hard a Parsi boy could rock from Time Magazine. A look at Freddie Mercury from the BBC's h2g2, the unconventional guide to life, the universe and everything, a guide that's written by visitors to the website, creating an organic and evolving encyclopedia of life. A Winter's Tale was the last song composed entirely by Freddie Mercury that he recorded. The song was inspired as he sat staring out the windows of their recording studio at Lake Geneva. 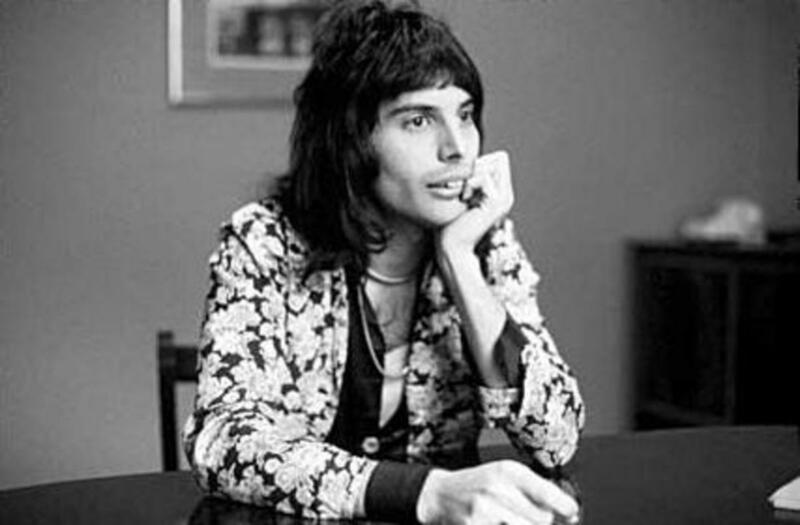 Freddie recorded the vocals and keyboards for the song and completed the last verse only a few weeks before he died. The last words of the song are "It's Bliss." This sentiment is a beautiful one for someone in their final days realizing how close he was to the end of his life, that hopefully he had found a sense of peace, tranquility and bliss. The "last" Queen album featuring Freddie Mercury, released four years after the death of Freddie Mercury. Four of the songs were hit singles in the UK: "Heaven For Everyone", "A Winter's Tale", "Too Much Love Will Kill You", "Let Me Live" and "You Don't Fool Me." The defining moment in any legend's life is their death. Before a great person dies, they are simply the fodder of gossip columns across the world, a temporary starlet just like all the others. After they are gone, a haunting shadow and a deep reverence hangs over their name forever. Past mistakes are forgotten, unsuccessful projects become masterpieces and their life story is viewed as if it were an ancient Greek tragedy, a fable or an urban myth. Source: Freddie Mercury. Fyne Times. Photo Source: Nick Halpern-Manners. Freddie. Some Rights Reserved. Creative Commons. Ironically, since he had been declared HIV positive, he had striven to keep his condition a secret and to ensure that no shame could come upon his family, yet his death helped to open the doors for debate worldwide. 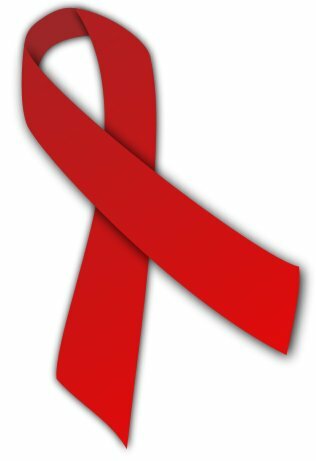 AIDS was no longer a stigma, a gay plague, a shame. His death took AIDS from being 'something other people have' to something the whole world needed to wise up to. In every tribute to the great man, from concerts to singles, books to t-shirts, AIDS awareness was ever present. When Mercury died, the silence surrounding AIDS died with him. George Michaels and Queen performing at the 1992 Tribute to Freddie Mercury. The Freddie Mercury Tribute Concert 10th Anniversary Edition features many of the performances from the 1992 Tribute Concert. To celebrate what would have been Freddie Mercury's 60th birthday on September 5th, 2006 two virtual online constellations were created in his name to benefit the Mercury Phoenix Trust. The goal is to fill the two constellations with as many stars and messages as possible from around the world. You can post your own personal message to Freddie and sponsor a virtual star in either the Lover of Life or Singer of Songs constellations. When you sponsor a star you will be asked to make a donation of your choice to the Mecury Phoenix Trust; this trust was established by the remaining members of Queen in Freddie's memory to help fight AIDS worldwide. By making the song available for free we hope to help Nelson Mandela with his campaign to get across the message that no-one is safe from infection. We have to be aware, we have to protect ourselves and those we love. The song follows the line of Mr. Mandela's personal message: it's in our own hands to bring a stop to this." Since 1992 the Mercury Phoenix Trust have been responsible for donating more than £8 million (equivalent of 16 million US Dollars) in the fight against AIDS making over 600 grants to charities worldwide. In 1992 the Freddie Mercury Tribute Concert for AIDS Awareness to launch The Mercury Phoenix Trust to distribute the monies raised from this concert. In the end, all the mistakes and all the excuses are down to me. I like to feel that I'm just being my honest self and as far as I'm concerned I just want to pack in as much of life and fun, having a good time as much as I can within in the years I have. Queen's tribute to their lost member Freddie Mercury. The impetus for the song came after the death of Diana, Princess Of Wales in August 1997, but is largely an eulogy to Freddie Mercury and to "anyone who died before their time." It's a Kind of Magic a documentary that went out on the day of his 60th Birthday; I think this is a nice documentary showing the life of Freddy Mercury before his music career when he was at his peak and when he died. Be aware that this is a documentary of his life and his lifestyles so may be more PG rated in some of the topics discussed. The Work of Freddie Mercury and Queen live on. I have just pulled just a small sampling of the many diverse examples of the work continuing long after the death of Freddie Mercury. His legacy and his music live on. The three remaining Queen members re-worked version of the song I was Born to Love You originally recorded by Freddie Mercury. This song was release with the Made in Heaven album. Queen was inducted into the Rock and Roll Hall of Fame in 2001.
actually QUEEN is God, four Gods joined in one. Share your thoughts, stories, memories, etc. Share your thoughts, stories, memories, in the comment section. Are You a Freddie Mercury or Queen Fan? @Rosetta Slone: Can't imagine my parents doing that, but my kids have done that. My parents used to play Queen all the time and dance around the house with us kids. Great memories. Best live band ever - they won me over at Live Aid. I absolutely love Queen. Freddie is deeply missed. Have you seen Adam Lambert sing with Queen? He did an MTV awards show and signed on to do some shows this summer. He is the only one who can pull it off in my opinion. 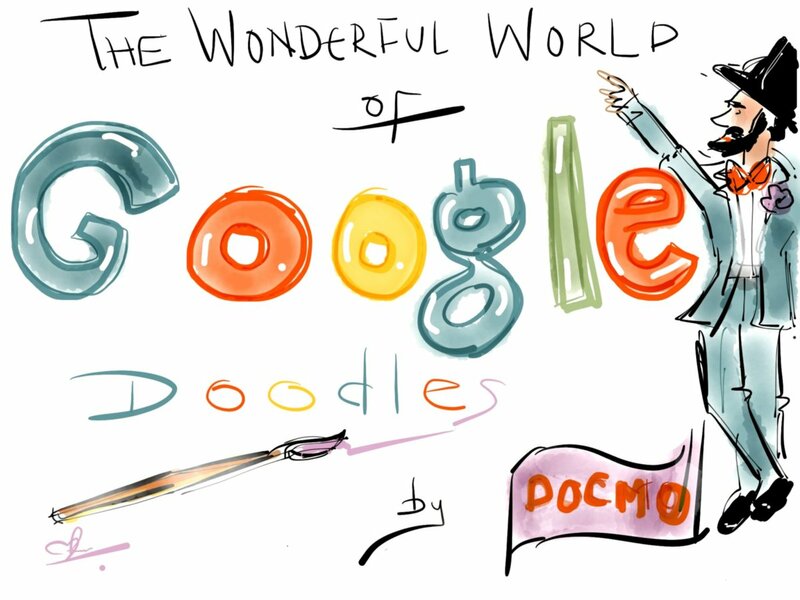 Look for it on You-Tube. Definitely a fan of both Freddie Mercury and Queen, one of the biggest disappointments of my "must see live in concert" list is that I'll never get to see them. There is however a band called Dios Salva a la reina (God save the Queen) a tribute band from Argentina and they are the next best thing, the band is incredible, check them out on YouTube. Thanks for the lens I enjoyed reading. I love Queen and Freddie Mercury. So tragic that we lost him. Love Freddie and this is a wonderful tribute to him. His legacy will certainly be with us for generations. An amazing vocal range. I never get tired of hearing his voice. I often think, what would he have done hadn't he died so young? I love almost everyone of Queen's songs, and his voice is unheard of these days...gee what a pity he died so early. i love the title of your lens. Freddie is the best ever; I absolutely love his music. What a personality! Fantastic lens. Blessed. Absolutely! My very first vinyl album I bought (with my own money) was Queen's Another One Bites the Dust. Freddie is definitely another legend. Freddie got his wish, he is indeed a legend in the world of rock music! there is no denying that he was a tremendous performer and blessed with a great voice. Thanks for all of the additional info! I'm a bit blown away. I've never looked into Freddie Mercury, and as already said...wow! That live aid concert was beyond words. Thanks for this. Wow, I learned a whole lot about Freddie Mercury that I never knew before, thanks. Wow! This was such a comprehensive lens. Freddie Mercury was a true performer. Blessed by a music loving SquidAngel. Probably the most charismatic performer EVER! Other musicians may have other talents, but nobody can compare to Freddie for his energy on stage. One of a kind. A great loss to the world. Freddie Mercury and Queen were possibly the first band that I really started to follow back in the 70's and I recently started a music blog with Bohemian Rhapsody as my first post in recognition of a really great band. WoW. Great lens you made about Freddie. Freddie Mercury is by far my favorite singer. Very thorough lens. Great lens. I enjoyed it very much. My daughter made her first webpage about her hero Freddie Mercury when she was 13 years old and his glorious voice blasted through our house at top volume. Thanks for the memories! Fabulous lens for a deserving legend. Love Queen forever! Wow, such an amazing lens You put so much work and effort into this page...nice job! I love Queen and I'm passing that legacy on to my kids. My 14 year old son even got up at a karaoke night and sang all of Bohemian Rhapsody all the way through. Great lens and congrats on the Best Celebrity Lens 2008.... you deserve it! Congratulations on the win for Best Celebrity Lens of 2008. For me to spend 30 minutes reading a lens, as I have here, it has to be a fabulous lens! Great job! Great lens and congratulations on your Giant Squid award! Freddie Mercury was an excellent singer and Brian May continues to be an excellent guitarist. Incredible tribute lens! 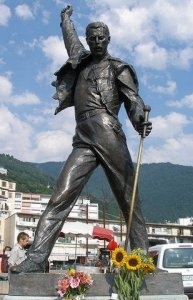 I can't believe there is a statue of Freddie Mercury! Congrats on the win. Congratulations for the 2008 Best Celebrity Lens! Yippee! Congratulations on your Giant Squid 2008 Award! Fantastic tribute to a true superstar. Many congratulations on your Award nomination. Congratulations on your Giant Squid Awards nomination! Excellent choice! Great lens. Congrats on the nomination. You got my vote. Congratulations on your 2008 Giant Squid Awards nomination! Beautiful voice. "I Want To Break Free" is my favorite. Have watched the video on YouTube quite a few times. I miss Freddie and can hardly believe it's been 17 years... No time to watch the documentary right now, but I will get around to it. Thank you for this wonderful tribute. I miss Freddi. On our honeymoon, my wife and I came across a Queen Tribute Band almost by accident. It was a wonderful time and a wonderful surprise. I felt like I had actually attended a Queen concert. One of the many highlights of the trip. Congratulations on a wonderful trip to Freddi and Queen. It is a 5* lens and it got my vote for best celebrity lens! Congrats on your 2008 Giant Squid nomination...woot! Beautiful tribute to a beautiful man! Great tribute to Freddie Mercury! When I was in London I went to see the play "We Will Rock You" and it was a great show. Definitely worth seeing. Freddie was one of the greatest rock singers ever. I always cringe whenever those American Idol wannabes try to do his stuff. It just don't work! Great lens . . . 5 stars for you. Thank you. This lens is great. You really hit the nail right on the head! Excellent Lens. I like the quality insight you have provided here about Who Is Freddie Mercury - Quee.... Keep up the good work. Yes Freddie, the Show Must Go On. Always in our hearts. Freddie's singing literally touched me and saved me. In 1984 I was suffering from depression and thinking of suicide. It was the chance hearing of Radio Ga Ga of all things that sparked the first interest I'd had in life outside my head. It wasn't a kind of magic, it didn't happen overnight but I did start on the upward track away from depression once I started listening to Freddie's and Queen's music. Strange but true. In these parts, one or two Queen songs are played by the stations here practically every afternoon! I say this lens is ready to be on Top 100! faved and 5* of course! Hope to see you in my carnival glass lens! More Freddie Mercury. My favorite is "I want to break free." Back in the day, I played it over and over and over... Great tribute. I love Queen! ***** for immortalizing Freddie Mercury on Squidoo. My favorite - Another One Bites the Dust. I remember roller skating to it as a kid!! I was one of the lucky few to be there at the Live Aid performance. Something magical happened that night. It was truly amazing! This is a wonderful tribute and compilation of memories. Thank you for honoring the legacy of Queen and Freddie Mercury. 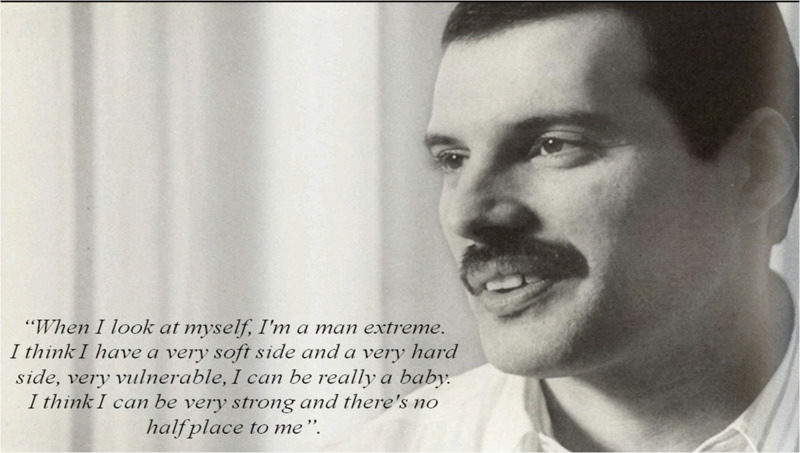 Freddie was one in a million. You've done a spectacular job remembering him. No way can I remember school without thinking of Queen and Freddie Mercury. You've made a great lens here!